Does San Francisco put the safety of affluent residents and gentrified neighborhoods first? The short answer is yes. This has become obvious as politicians and the media create an uproar over auto break-ins. Calls for hearings and demands for police accountability contrast sharply with the political and media inertia over open drug dealing in the Tenderloin. A criminal activity that on a daily basis puts women, low-income children, seniors and disabled residents and many others at risk. I found this enhanced sensitivity to the crimes of affluent neighborhoods particularly striking when the San Francisco Chronicle made a big story out of its reporter witnessing a break in on Lombard Street while covering the issue. This was supposed to show how blatant these crimes were, and how the police should be doing more. When I saw that Chronicle report I recalled when the paper’s CW Nevius was offered drugs while reporting on open drug dealing in the Tenderloin. I cannot tell you the number of reporters I have been with who have been asked to buy drugs in the Tenderloin, yet that never became a separate story highlighting ineffective policing. Allocating public resources is where the rubber really hits the road on gentrification. And as the uproar over auto break ins vs. the silence over Tenderloin drug dealing shows, even “progressive” politicians allow the police to provide inferior public safety to low income residents in non-gentrified neighborhoods. Too many “progressive” supervisors bemoan gentrification but ignore the need to make non-gentrified neighborhoods safe. While drug dealing in the Tenderloin is treated as “just the way things are,” neither the police nor politicians can get away with that excuse when dealing with the more affluent victims of auto break ins. I agree. I also believe that living with drug dealers on sidewalks should not be part of living in the Tenderloin. Why are auto-break ins in the Marina an unacceptable status quo but harassment of women by drug dealers in the Tenderloin is? I have never heard an elected official in San Francisco attempt to hold a Police Chief publicly accountable for open drug dealing in the Tenderloin. Stefani’s demanding police accountability for auto break ins the Marina has no Tenderloin parallel. Stefani found the 85 auto break ins citywide each day a situation that was “out of control.” She called for a series of hearings at the Board to monitor the SFPD’s progress. In contrast, the Board has never held hearings on how drug dealers threaten Tenderloin residents, particularly women. No elected official has ever called the police to account for depriving Tenderloin residents of the public safety Stefani expects in her neighborhood. I have previously explained how the creation of an expanded Tenderloin station (which now includes Market Street, 6th Street and two shopping centers where the police spend a lot of their time) is the chief cause of increased Tenderloin drug dealing (See “How Police Fail the Tenderloin,” January 9). There is clearly a shortage of officers in the Tenderloin station, as residents predicted would happen. Yet Chief Scott refuses to shift officers to combat dealing in the Tenderloin. Even on the blocks where it is most visible. My staff has been unable to learn how many officers are in the city’s various police districts. This critical fact, which likely underlies how gentrified neighborhoods get more than their necessary share of police, is not a public record. We have learned from informal sources that Ingleside Station has 100 officers, Central 115 and the Richmond 75. We do not know any others. Southern Station’s numbers would be most helpful because Chief Suhr’s ill-conceived 2015 redistricting plan took all the high crime areas out of Southern and put them in the expanded Tenderloin Station. It would be great to get the SFPD’s district staffing allocations from an elected official, the Police Commission, or the SFPD itself (I personally asked former Chief Suhr for this information and he refused to give it). After all, how can we assess whether the police is effectively allocating resources when they treat their staffing decisions as top secret? I sympathize with victims of break ins. But the perpetrators of these crimes, unlike drug dealers, are not physically threatening people or harassing women walking to their jobs or homes. These criminals do not create fear in people walking down any street. I see families forced to walk by drug dealers on their block as a worse social problem than auto burglaries. There’s been a lot of talk in recent weeks about how women are treated in San Francisco; ask women working or living in the Tenderloin about their constant harassment from the overwhelmingly male drug dealers, and their frustration at the lack of police response. Drug dealing is also much easier for the police to solve. Unlike the five second break in and grab that typifies auto thefts, dealers are openly offering drugs to passers by and are easily identified and located. We have so little accountability for violence in the Tenderloin that nobody even knows what happened to the drug dealer who threw burning coffee at the operator of Allstar Donuts at Golden Gate and Hyde. Mayor Lee was so upset by the incident he went to visit the woman but nobody even knows whether an arrest in the case has even been made. I have to believe the assailant would be in jail today if that crime occurred on Chestnut Street. The SFPD leadership, like former Chief Greg Suhr, has historically believed drug dealing is just “how things have always been” in the Tenderloin. 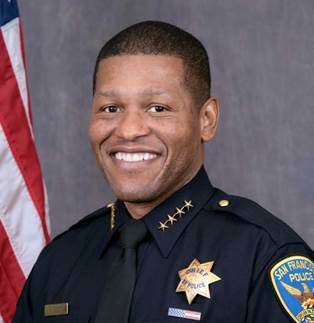 I had hopes that Chief Scott would have a more modern view of Tenderloin policing but he has turned his entire command over to Suhr’s leadership team—which still carries out Suhr’s classist and outdated view of the Tenderloin. My organization, the Tenderloin Housing Clinic, noticed that the Curry Senior Center, Tom Waddell Clinic and other Tenderloin service providers were hiring private security to protect their employees and clients. We are now doing the same. If we do not see improvement soon I will be encouraging the neighborhood’s property owners to seek property tax reductions for the city’s failure to provide police services. Let the city get the tax revenue from the upscale neighborhoods the police are keeping safe; the Tenderloin should no longer accept taxation without police representation.